My wife Luann wants to help promote an annual event called the Fall Foliage Artist Studio Tour (FFAST). The organization has a website, and could publish a calendar there, but a calendar with only a single date doesn’t make much sense. And yet this event wants to be written down only once, then flow through the Keene hub as well as other local and regional hubs. How can you arrange that? As the curator of the Keene hub, I keep a special calendar of one-off and recurring events. These are events that I happen to know and care about, aren’t available in any existing calendar feed, but ought to be syndicating through the hub. I only do this for stuff that I care about, though, and the FFAST event is Luann’s thing, not my thing. She’s willing and able to curate certain art-related events for our region. One way to do that would be for her to spin up a new elmcity hub for the purpose. But that’s a heavyweight solution. For things like FFAST she needs something lighter. Hence the method described in this post, which for lack of a better term I am calling subcuration. 1. Using a private calendar for your personal stuff. 2. Using an auxiliary public calendar for public stuff. 3. Viewing both calendars together so you see everything, just as if you kept it all in your personal calendar. 4. Making the public calendar’s iCalendar feed available for syndication. My personal Google Calendar is called Jon Udell (private). 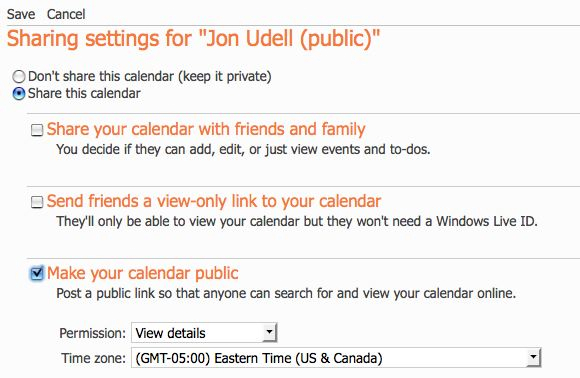 To verify that it’s private, I can follow this trail of links from the GCal home page: Settings -> Calendar Settings -> Calendars -> Jon Udell (private) -> Share this calendar. The checkbox named Mark this calendar public is unchecked, as it should be. 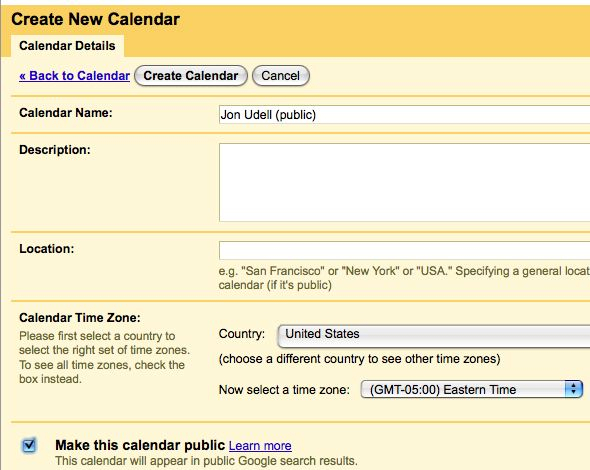 Now I’ll create a new calendar, called Jon Udell (public). To make it public, I check the checkbox. As Google explains, that means the events here will appear in public Google search results. As Google does not explain, it also means that the iCalendar feed for this calendar is open to syndication. Here’s a view of both calendars. It combines stuff from my personal calendar (birthdays) with stuff from my public calendar (FFAST). From this point of view, it’s just like keeping everything in my personal calendar. 1. Right-click (or alt-click) the button. 2. Copy the link address. 3. Bookmark it (if you’re a curator), or paste it into an email to a curator (if you’re a subcurator). 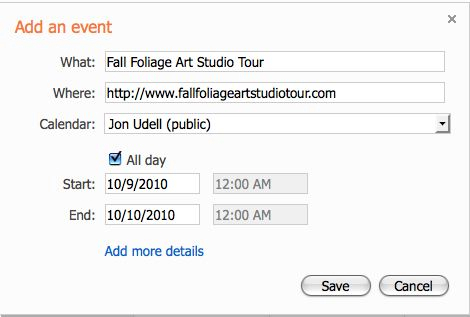 As before, my private calendar is Jon Udell (private). 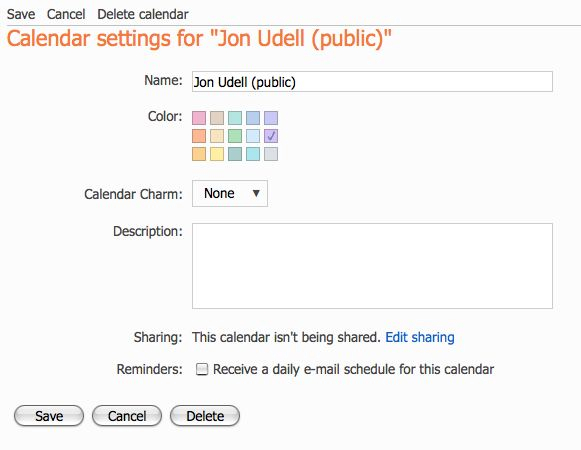 Now I’ll create a new calendar, called Jon Udell (public). Here I check Share This Calendar and Make Your Calendar Public. These two examples illustrate a set of principles in the context of two different online calendar applications. The same principles will apply to other calendar applications that support multiple calendars, and can publish selected calendars in iCalendar format to open URLs. 1. Use a private calendar for your personal stuff. 2. Use an auxiliary public calendar for public stuff. 3. View both calendars together so you see everything, just as if you kept it all in your personal calendar. 4. Make the public calendar’s iCalendar feed available for syndication. Author Jon UdellPosted on 19 May 2010 25 Feb 2017 Categories ., . 2. 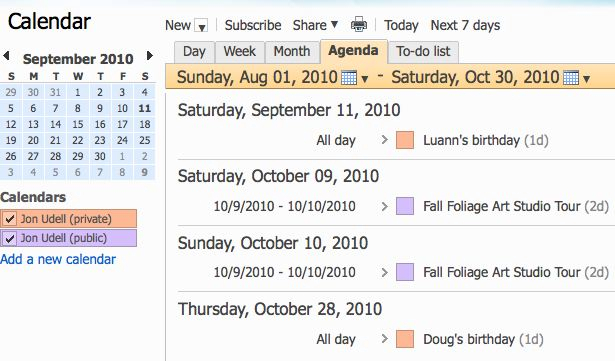 Select the calendar you want published on MobileMe. Note: Apple’s help files on this subject are from iCal 3.0, and reference .Mac. Zounds! Hi Jon. I’ve been really happy with Tungle (http://tungle.com). It does a good job of being a calendar aggregator. Then, on my profile page (http://tungle.me/boris) I can selectively take items and make them public. I run three private calendars already (public, business 1, business 2), and making items selectively public via Tungle is stuff I’m just starting to experiment with. 1. You keep a mix of personal and public events in one of the calendars that Tungle can sync from. 2. You mark the public events as public in Tungle. 3. Those events show up in your public Tungle iCalendar feed, which can then be plugged into a syndication network. I’m curious to know if this is actually possible. Pingback: Think like the web or even like Jon Udell | Life's simple, why change it?